Follow us @walkentertainment on Instagram and Facebook! From the moment you begin you can notice that everything’s hand drawn and it draws you deeper into the cities and caverns below the well. 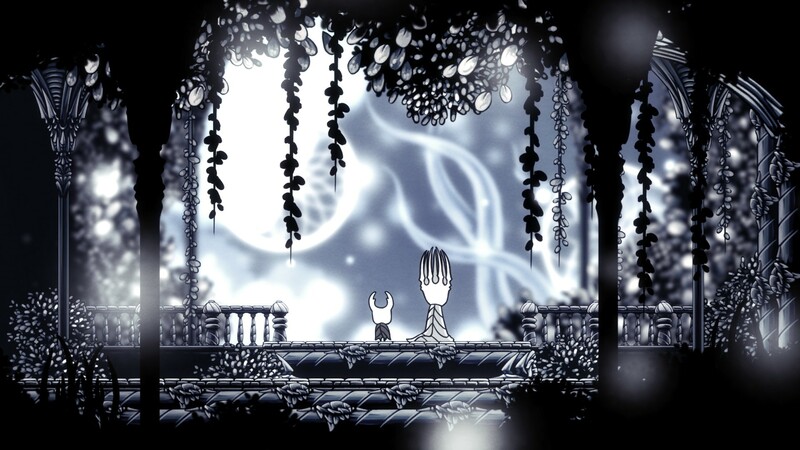 Beautifully hand drawn environments come alive as you delve deeper into the darkest depths of Hallownest’s unforgiving kingdom bursting with majestically treacherous secrets to discover in awe and wonder. It’s time to see what it’s like to live a bug’s life. You’ll stumble into the territories of many large creatures who will either want to eat or help the Knight. A lone bug wanders in a dark setting, hardly any light guides his path but he pushes forward. A city in a distance is noticed as he stands over watching a cliff. He jumps down and this is where you begin. Plunged into an unknown world with know other direction but right to go, the player beings to learn the basic controls to run, jump and attack with your nail which is the protagonist’s main weapon. After having passed the short tutorial you encounter the city with one lone resident standing in the midst of a lamppost and steel bench. He speaks of how many travelers have come seeking treasures underneath the towns well but few, very few ever returned. This is where you begin to descend into a remarkable journey discovering a kingdom brought to ruin. Step by step, you being to appreciate the amount of detail was went into making the environments that react to the players attacks by being destructible. Adventure through lively ecosystems with your trusty nail by your side to defend you from predators. You begin with masks that replace the commonly known hearts for a life bar. The knight is able to accumulate soul, which is shown on the top left corner with encapsulated white energy. You can either choose to use it to replenish health or for oncoming defeating enemies. If you die once, you will be transported to your nearest save point and leave your Shadow behind in the section of the game where you died carrying all of your geo, in-game currency which are fossilized shells. Losing your Shadow also takes away the ability to store ⅓ of your soul but either way now you must then return to that same area without dying and defeat your Shadow to be whole again. If you die while trying to retrieve your Shadow all your geo will be gone forever. There is absolutely no ability to successfully vault the called geo anywhere within the game. It’s a pretty tough, reminiscent of the Dark Souls formula with Shovel Knight. I can’t stress it enough thought, this game is challenging, and trying to implement these gamble-risk designs aren’t for everyone. 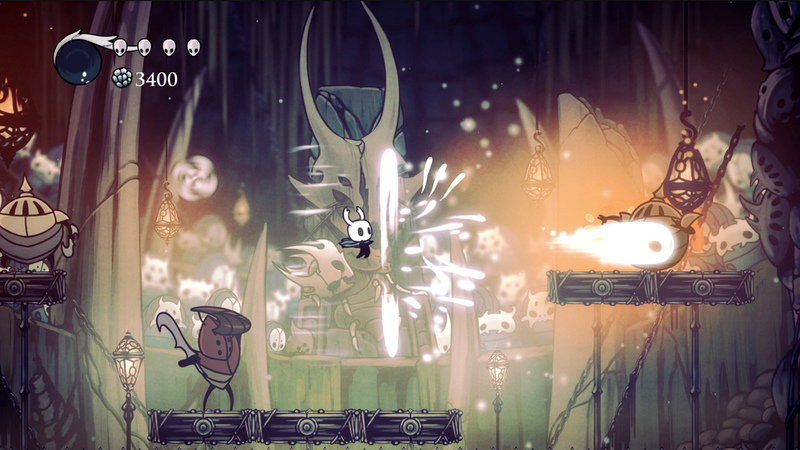 Parrying is another important factor of Hollow Knight. The learning curve to successfully understand it is more than a couple of hours but eventually as everyone knows, practice makes perfect and pretty soon you’ll be able to use your nail to bounce on enemies and deflect attacks. 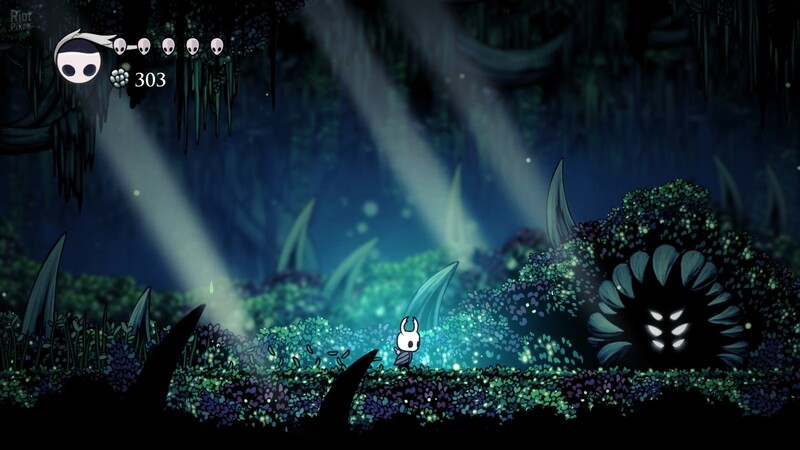 As you adventure into Hollownest’s underground labyrinths, you’ll come across stories of the kingdoms forgotten past and encounter strange friends that will help the young Knight on his journey by providing assistance. You will also find guardians that still protect their territories or sacred grounds if you trespass. Each fight is varied, but most important of all extremely challenging. You’ll die and again, and again until you understand the pattern to defeat them. The sense of accomplishment is always felt after having overcome an obstacle in Hollownest. The game gradually becomes increasing difficult and feels punishing in most areas. A very important key factor here is to continue exploring (especially backtracking) to build your powers if you’re having an extremely hard time with some boss fights. Find a bench to rest and prepare for your next descent into Hollownest. I can’t deny that this game looks stunning. 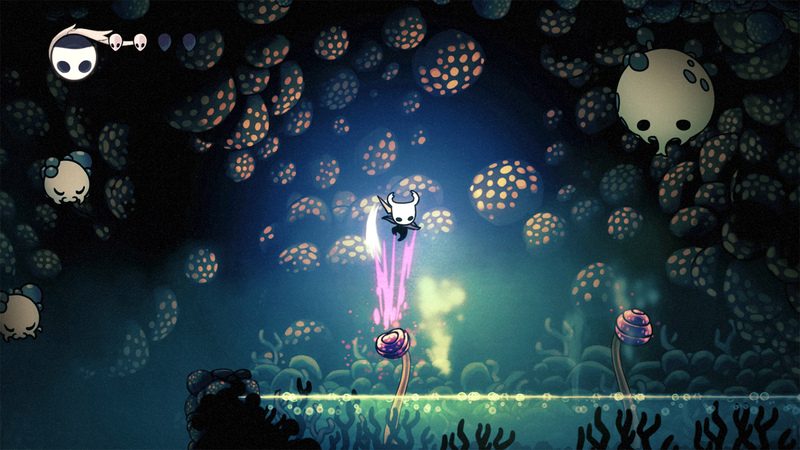 Every area of the game is unique, and colorful, filled with wildlife and many cleverly hidden pathways to discover. The only bugs ever presented are the characters in game. 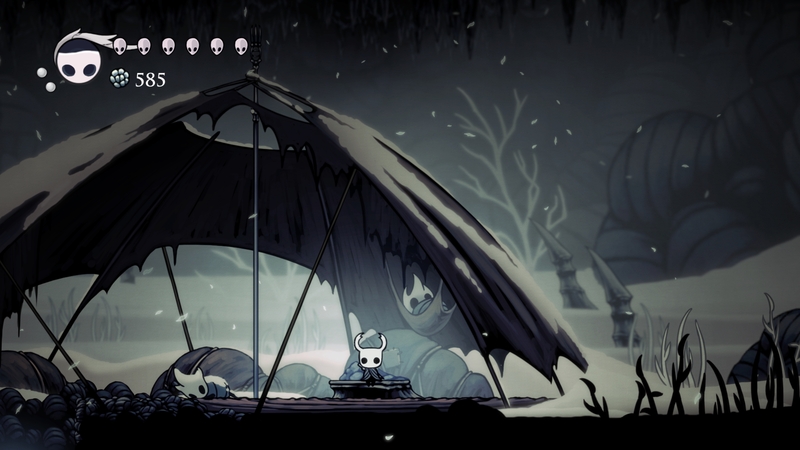 Never has Hollow Knight crashed or lagged! Everything in the game is finely well balanced and all that is left to do is practice! A very dark palette of colors is present which is understandable since you’re spent underground where light scarce but that doesn’t exclude the fact that under the darkness lies beauty awaiting to be rediscovered by you. Moments like this where you can just stop and enjoy the artwork is always a pleasure. We recommend doing it often. The whole game is Team Cherry’s first dream to be realized and it’s been released as an incredible first glimpse of what’s to come from such a small and ambitious studio with only three developers. Every nook and cranny has an array of unforeseen hidden secrets awaiting to be discovered. Each section has been carefully thought out and given an insurmountable amount of love through each step taken into the Hollownests atmosphere. What a delight it is to play this game. Highly recommended and definitely a game that’s worth sucking all of the juice out. We can’t wait to see what comes next. The Colosseum of Fools is insane! So challenging and will put your skills to the test! There is absolutely no ability to successfully vault the in-game currency.